Mercedes-Benz launches its most powerful X-Class bakkie yet - the new V6-powered X350d. With a powerful 3.0-litre six-cylinder engine, 7G-TRONIC PLUS automatic and 4MATIC permanent all-wheel drive, the new X350d 4MATIC flagship model develops 190kW/550Nm. 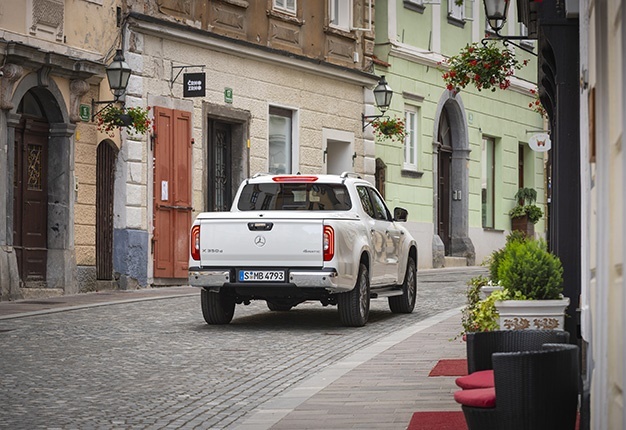 The tough performance double cab completes the sprint from 0 to 100km/h in 7.9 seconds. Permanent all-wheel drive ensures high levels of driving stability and handling dynamics both on and off the road. The 7G-TRONIC PLUS automatic is included as standard, complete with steering wheel shift paddles, operates with no interruption during gear changes. The wide gear spacing allows an individual driving experience via the Dynamic Select system. With a choice of five driving modes, the engine response can be changed by fingertip control – from relaxed and comfortable to sporty and dynamic. Comfort: This mode is activated automatically when the engine starts. It provides comfort, emphasising harmonious accelerator characteristics as well as early shift points. Manual: The automatic transmission can be manually operated using the gearshift paddles on the steering wheel. This leads to far shorter shift times than in the Comfort and Eco programmes. Off-road: This mode is suitable for driving on challenging terrain. It offers higher shift points and a flatter, and therefore more precisely adjustable, accelerator characteristic curve. The 4MATIC permanent all-wheel drive with low-range reduction gear and differential lock on the rear axle ensures excellent performance and traction on a wide range of driving surfaces. There are three all-wheel-drive modes to choose from: 4MAT for increased vehicle dynamics, 4H for improved traction off-road, and 4L for tough off-road terrain. With the all-wheel-drive system and the suspension with its long spring travel and ground clearance of 222mm, the X-Class V6 effortlessly climbs gradients of up to 45 degrees, fords water courses with a depth of up to 600mm, and maintains its poise on inclines of almost 50 degrees. With 1.65mm at the front and 1.62m at the rear, the X-Class V6 has a wide track, providing the ideal prerequisites for optimum driving stability and higher cornering speeds. At 3.1m, the wheelbase is also longer than in many midsize double cabs. This reduces vibrations during the journey and makes for smooth and reliable straight-line stability. With an anti-roll bar to reduce body roll, coils springs fitted to the axle to balance the comfort of suspension, and shock absorbers designed to be flexible in generating counter-balancing forces, the X-Class V6 offers its passengers a level of refinement on a par with the V-Class people carrier. For passive safety, the standard equipment includes seven airbags and the i-Size attachment system for two child seats. With optional Active Brake Assist and Traffic Sign Assist , two driver assistance systems are at the ready to simultaneously increase active safety and comfort. 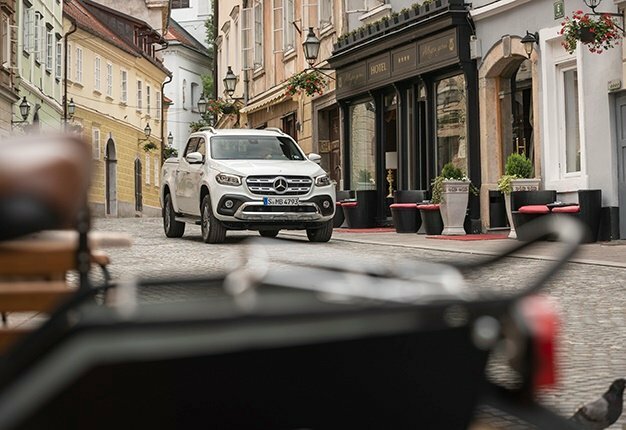 Additionally the X350d 4MATIC – as the top model of the X-Class –also features Active Lane Keeping Assist as an option. The X 350 d 4MATIC is available in the equipment lines Progressive and Power. The Progressive line includes the following as standard: 17" 6-spoke light-alloy wheels, air vents in electroplated silver chrome, leather-lined steering wheel and parking brake, the infotainment system Audio 20, and an eight-speaker system. Standard features in the high-end equipment line POWER include a simulated, chrome-plated underride guard in the front bumper, a chrome-plated rear bumper, 18" 6-spoke light-alloy wheels, LED High Performance headlamps, electrically adjustable seats, and the infotainment system Audio 20 with a multifunctional touchpad. Optional extras and extensive range of accessories for individual character types. Mercedes-Benz Vans has designed an extensive range of accessories so that users can customise their individual X-Class V6 vehicles even further. If required, the design, functionality or off-road capability can be enhanced to suit specific needs. In addition to the new sports bar, which can be combined with a roll cover in black or silver, there is a choice of styling bar, hard cover, hardtop, stowage box, load bed liner, load-securing rails in the load bed, and an underguard protector.